Of all the body systems, the nervous system is the major control system of homeostasis. It provides monitoring, response, and regulation of all systems in the human body and other organisms. It functions from the tiny level of individual cells to affecting the whole body at once. Receptors inside and outside the body are constantly monitoring conditions and watching for changes. When a body system leaves a set point and falls outside its normal range, signals are sent through the nervous system which trigger responses to bring the system back into the normal range of functioning. This is the process of homeostasis. These complicated and intricate processes have evolved over millions of years. For example, thermoreceptors and mechanoreceptors in the skin sense changes in temperature and pressure, respectively. Then, signals sent from them to the brain make it possible to detect situations that could cause injury or death. In addition, nerves make muscles contract which moves the bones of the skeleton, making it possible to evade predators and/or fight. This ability to perceive the environment and reacting to it is critical to maintaining homeostasis in the body. The nervous system is intricately involved in visual perception which also helps maintain homeostasis. In humans, there is a thin layer of nervous tissue called the retina covering the rear of the inside of the eye. This tissue is populated with millions of photoreceptor cells, ganglion cells, and bipolar cells. The cells detect light and transmit electrical information to the brain via the optic nerve which results in a visual picture. Pupil dilation is also controlled by the nervous system, optimizing the amount of light entering the eye for best vision. Vision allows animals to see and escape danger and find food and mates. The nervous system is also responsible for regulating the core temperature of the body. When conditions are too warm and body temperature rises, the blood vessels dilate causing heat loss to the environment. Nerves trigger sweat glands to release fluid that evaporates and cools the skin. Conversely, a drop in core temperature makes blood vessels constrict to conserve heat. The nervous system also triggers muscles to shiver to generate heat and warm the body. 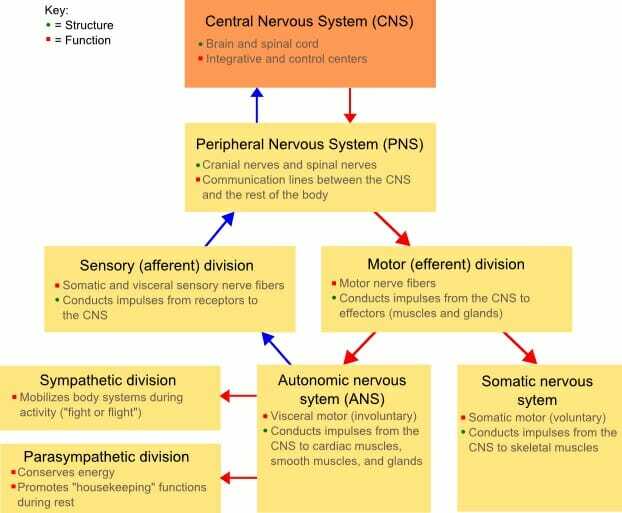 The autonomic nervous system is comprised on the sympathetic and parasympathetic nervous systems which both have critical homeostatic functions. The sympathetic system innervates the heart and increases heart rate and the force of its contractions. It also controls the constriction of blood vessels and dilation of bronchioles in the lungs. The parasympathetic system has the opposite effects on the heart and lungs but is has no effect on blood vessels. The image above shows the components of the nervous system. Note the green and red dots indicating the structure and function, respectively, within each component.